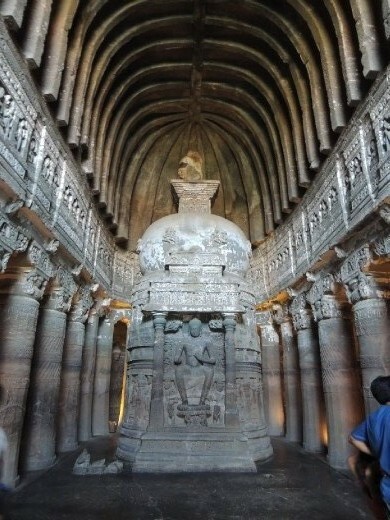 The Ajanta Caves contain two kinds of Buddhist art, chaityas/places of worship and viharas/monasteries and were constructed in two major time periods. The first about the 2nd C BCE and the latter in the 5th-6th C CE. After the decline of Buddhism in the 8th C, the caves were deserted and over the subsequent centuries covered with vegetation. In 1819 a British hunter found the caves by accident while he was tiger hunting. A tiger used one of the larger, and supposedly oldest caves, Cave 10, as its den. The Waghur River below the horseshoe cliffs where the caves are located translates to “Tiger River.” The tigers have long since been hunted to extinction in the region and the Archeological Survey has changed the course and depth of the river, but the caves and their artwork remain. Ajanta is famous for ancient Buddhist painting as well as for its sculpture and architecture. Unfortunately, prior to the relatively recent changes made by the Archeological Survey, the river would flood the caves and this damaged most of the lower halves of the floor to ceiling paintings. I never got the entire story, but it appears that there was a dam was built higher upstream and when water was released the river level rose so high it flooded the caves and sacred spaces. This did not seem to be a problem when the site was inhabited by the monks. When the monasteries were in use, the members of the sangha would just go down a regular sized one-floor staircase to the river to gather water. The flood damage happened over decades, but was finally stopped in about the 1960s or 70s when the dam was changed and trenches dug around the base of the horseshoe cliffs. Now there is only a trickle of water in the river, which is a good 50 feet below the original water level. The lower paintings didn’t survive the water damage, but many of the upper ones did. Water wasn’t the only destructive element, however, people were as well. As with the Christian frescos in Turkey, many of these images have had the faces hacked away by Islamic radicals. Aurangabad is named for the zealot son of Shar Jahan of Taj Mahal fame. This son imprisoned his father, took over the throne, and made it his personal mission to destroy “pagan” images of all kinds. More recently graffiti has taken its toll on the wall paintings. These wall paintings are not frescos in the European sense as they were constructed with other methods. The monks who made them used a mixture of clay, cow-dung and rice-husks that covered the rock wall about one and a half cm thick. They then spread a coat of lime to smooth out the surface before brush drawing an outline of the figures. The outlines were then filled in with paint made from crushed stone, soil and copper oxide. They also used lapis lazuli, which they must have obtained from Afghanistan as it is the one non-local color used. The paintings have at least two levels of pigment on them and some even have stones for necklaces and bracelets giving off a 3-D effect when light is show on them. Shading and toning were used to give the paintings relief and perspective effects, which were not seen in European painting for another six centuries. The wall paintings generally tell stories from the Buddha’s life, that of the Jataka Tales, or from the sutras. The ceiling paintings are more decorative, but there are a few traces of former mandalas. There is also a small fragment of a “Wheel of Life” outside one of the viharas, which surprised me as I am used to associating that image with Tibetan Buddhism, but here it was much earlier. Another aspect that I found fascinating was the Buddhist use, both during the 2nd C BCE images, which are Hinayana as well as the later ones, which are Mahayana, of seductive women’s images throughout the caves. The image of the Bodhisattva as a woman is one of the central threads throughout the cave complex, and the earlier images imply that there was a seamless iconographical heritage in the development of the Mahayana Bodhisattva concept. The viharas are laid out the way they are in Nepal today. There is a central hall with monks cells lining the sides. Only the later ones have a stone bed, the earlier ones are simply meditation cave cells. The monks, like many ancients, were keen observers of the heavens and Cave 19 is aligned so that light shines on the central Buddha on the Winter Solstice, while Cave 26 is aligned to highlight the Buddha on the Summer Solstice. Cave 26 is also the one with the Mahaparinirvana Buddha. Cave 19 is a chaitya hall. The caves are not numbered in chronological order but rather in geographical order. The earliest ones were caves 9 and 10 and there is a difference of opinion as to which of these was first. Both are amazing as the pictures in the galley can demonstrate. Ajanta is a true treasure trove of Buddhist wall painting art, sculpture and architecture. Each of the columns is perfectly aligned with the others within its group. The imagery tells stories in paint and stone. Even after fifteen hundred years and massive numbers of tourists within the last half-century, they speak to those who listen. The site is now a living museum, but it has not lost its sacred feel. The chanting of the ancient monks lives on amid the chatter and clamor of the crowds today.